Jose Mourinho is eyeing a treble of trophies for his Inter side. 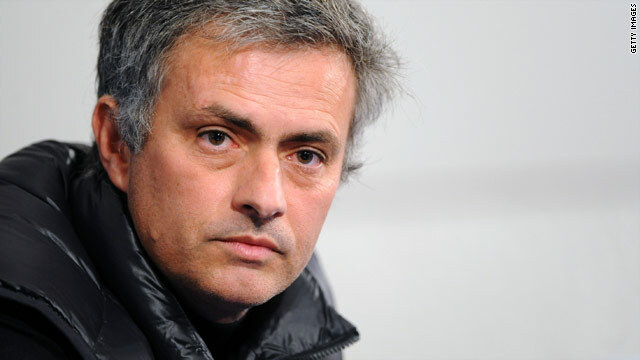 The Portuguese has described the event as "even bigger than the World Cup"
(CNN) -- Inter Milan coach Jose Mourinho will lead his Italian team into their first European Champions League final in 38 years on 22 May. His task will be to drive Inter Milan to their first European Cup title since 1965 by defeating German champions Bayern Munich at the Bernabeu Stadium in Madrid this Saturday. Like Bayern coach Van Gaal, the 47-year-old is targeting a treble, having already secured the Italian League and Cup titles this year. A victory for the Italians would also signal a second treble for Mourinho who last achieved the three required victories at Porto back in 2004. Inter's run to the final of the European competition was made all the more impressive with a win over title holders Barcelona in the semifinal. After promising but brief spells coaching at Portuguese sides Benfica and Uniao de Leira, Mourinho brought home his first silverware while in charge at Porto where he claimed the league and cup titles in his first year, and treble in the second. Mourinho then moved on to English Premier League side Chelsea where he won six trophies in his three years at the helm, including the league titles in 2005 and 2006 and the FA Cup and League Cup in 2007. Since 2008 Mourinho has been at Inter Milan where he won the Serie A title in his first year as coach, successfully defending the title in 2010 as well as winning the domestic cup. If the team go on to win the Champions League final, it will be the first time the Milan side has done so since they beat Benfica in the final in 1965. Perhaps the most impressive stat to Mourinho's name is his run of 136 unbeaten home matches across his reigns at Inter Milan, Chelsea and Porto -- his last league defeat on home turf coming at Porto in 2002. "Don't call me arrogant, but I'm European champion and I think I'm a special one," were the first words spoken by Mourinho upon his arrival at Chelsea in 2004, and he has since been dubbed "The Special One" by the English press. Mourinho has never failed to provide the media with entertaining press conferences and many memorable quotes though such outspoken comments have caused trouble down the years as well as making Mourinho a big personality. However, his ambition on the football field cannot be underestimated and there is speculation that Mourinho might leave Inter for Real Madrid after the final. He has been quoted in the past as saying he has dreams of coaching in England, Italy and Spain, so it would not be a surprise if his next challenge was at the Bernabeu. Mourinho learnt his trade working as assistants at Estrela Amadora, Porto and Barcelona. At the Spanish club he was first a translator for English manager Bobby Robson and then second in command to Louis Van Gaal, who he says he learnt a lot from in the early stages of his career. "Van Gaal is a very confident person and at a moment when a coach like me was young, that was very important. He gave me the confidence to coach the team on the pitch," Mourinho said. The rivalry between the pair intensified when Mourinho became the first coach in history to guide three different teams to the semifinals of the Champions League -- only for Van Gaal to do the same a day later. And whoever finishes on top on Saturday will join an even more elite group of those to have coached more than one team to the final of the competition. Austrian Ernst Happel and German Ottmar Hitzfeld are the only two coaches to have done so in the past. Whether or not he can do it this weekend Mourinho is confident that he will at some point in his career. "I will do it one day, but I would love to do it now because of the circumstances of Inter not winning the competition for a long time." Mourinho has been praised for his team's resilience in the second leg of the Champions League semifinal against Barcelona, when despite being reduced to 10 men they still managed to keep the Spanish challenge at bay and go through 3-2 on aggregate. The Inter coach is reported to be a big fan of long fitness sessions and punishing long training runs to keep his squad in shape -- a technique also used by Van Gaal -- and it is this which is thought to have helped get Mourinho's side through to the final. He will be hoping that this will also stand them in good stead in the final against Bayern Munich, especially as like the German team who are without Franck Ribery, they will be missing a key player through suspension -- midfielder Thiago Motta. Mourinho will be looking to veteran captain Javier Zanetti, Dutch playmaker Wesley Sneijder and Cameroonian striker Samuel Eto'o -- who has won two Champions League titles with Barcelona in 2006 and 2009 -- to take him to victory in the competition that he has described as "even bigger than the World Cup."